My friends were joking about this mask having ears, but it totally surprised me when I opened it up and found a full on cat-mask inside. It looks hilarious! I really think beauty should be fun, and this definitely hits the mark. It’s not just about the novelty, though – I actually really liked the product. It contains tea tree and aloe vera, to fight spot-causing bacteria but not be drying. I loved that combo – my big concern with any products for ‘problem skin’ are that they will be very harsh. This mask left a lovely balmy feeling on my skin. It also smelt amazing, and my skin seemed calmer the next day, so all around a big thumbs up from me. You can get these in packs of ten from Look Fantastic. I knew I wanted to try another Tony Moly mask. I hear such good things about these, although I wasn’t blown away when I tried the seaweed version after my trip to Valencia. I definitely preferred this one. Again, it left a nice balmy feeling on my skin and my face still felt hydrated the next morning. You can buy Tony Moly from Cult Beauty. This was the most expensive of all of the masks I bought, but it was another one I felt had more lasting effects. My skin has been quite angry lately, but after using this I felt that it was less red and seemed to have calmed down a bit. I bought another one as I think this is a really good mask to have in your arsenal for when you get a flare up. 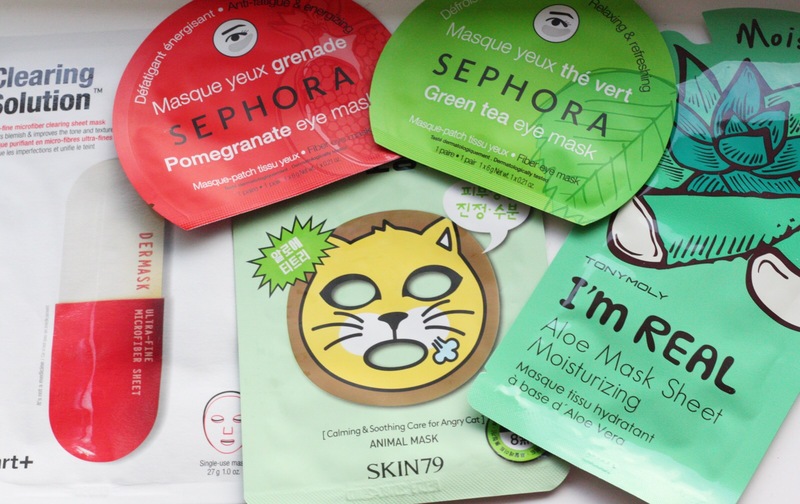 Are you a sheet mask fan? I’d love to hear where i can get hold of them in the UK!